Our lighting restoration and custom lighting capabilities include research for historic accuracy, drawings, mock-ups, metal fabrication, polishing, painting, hot and cold patina application, welding, abrasive blasting, refinishing metal components, glass fabrication, replacing all electrical components, rewiring and testing in accordance with UL standards. To discuss our capabilities in more detail, please call us at 1-800-922-1469 or use our Contact Form. Our process begins with reviewing existing documentation including sketches, architectural drawings, historical photographs, and an on-site inspection to gather the full scope of the project requirements. From there, Grand Light will develop a detailed proposal. When required, Grand Light also develops conceptual sketches and drawings. As required Grand Light conducts research to assure the historical accuracy of all historic projects. The creation of custom drawings is an important part of the process when it comes to the production of custom lighting. Whether it be a replication or modification of an existing lighting fixture, the client’s design, or a creation by Grand Light’s design team, a drawing will serve as the blue print for our production process. 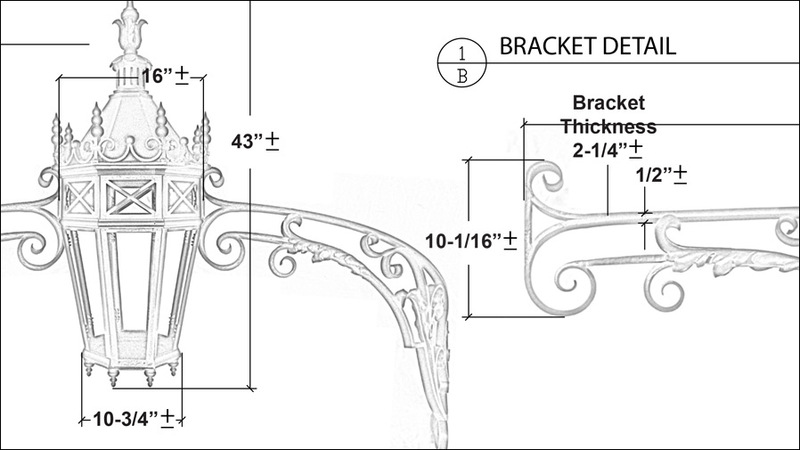 Our drawings and subsequent mock-ups address the smallest of detail, allowing our clients to fully visualize the fixture before it goes into production, which reduces the possibility of error, and allows Grand Light to fulfill its commitment of delivering high quality lighting fixtures on schedule. Grand Light offers customer consultation and support in the implementation of your historic lighting and custom lighting projects. Our experts assist in fully discerning a clients ideas, design, and expectations while determining the projects scope, schedule, specifications, and special provisions. Project documentation, product submittals, and reports are made available to clients for approval including work scope and evaluation recommendations based on a lighting fixture’s existing finish, electrical, mechanical, and structural characteristics. One of the most important tasks before starting a project is to survey the lighting fixtures on-site. Typically, a site survey involves an on-site visit by 1-2 Grand Light specialists to examine, identify, and document the existing condition and all mechanical, electrical, and finish deficiencies of each lighting fixture. Site surveys are common with large-scale restoration projects, and provide key insight into project cost projection, operation and maintenance considerations, design and construction principles, and required restoration processes. 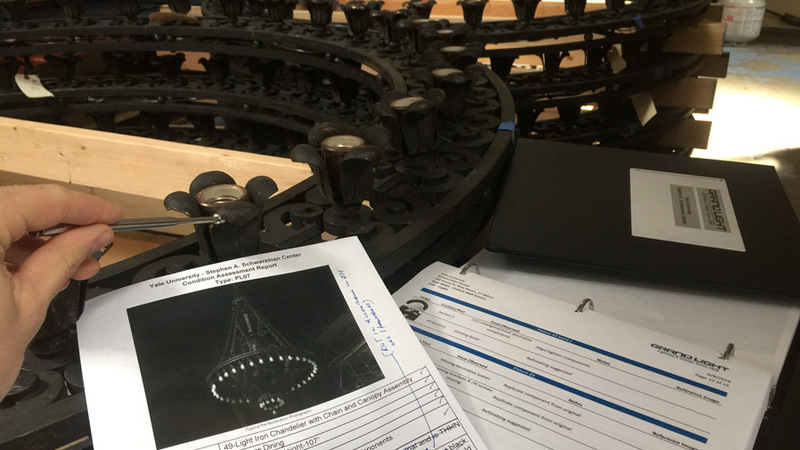 An important part of the lighting restoration process requires an overall evaluation including detailed documentation of all individual components finish, mechanical, and electrical condition. The evaluation often contains corrective action for any deficiencies as well as mock-ups, testing, process, and samples. Sketching is one of the most important activities in the design and development of custom lighting projects. Grand Light designers create concept sketches allowing our clients to fully visualize the fixture prior to shop drawing and production mock-ups, which reduces the possibility of miscommunication, and allows Grand Light to fulfill its commitment of delivering high quality lighting fixtures on schedule. Grand Light engineers review existing documentation involving sketches, drawings, photographs, or an on-site inspection prior to the development of any drawings. The creation of custom drawings is an important part of the process when it comes to the production of custom lighting. Whether it be a replication or modification of an existing lighting fixture, the client’s design, or a creation by Grand Light’s design team, a drawing will serve as the blue print for our production process. A mock-up is provided for customer review and approval prior to final production. Mock-ups are essential in reflecting and testing design choice, circuitry, layouts, and aesthetics by providing a realistic, physical perspective. They also provide the benefit of revealing electrical and mechanical issues that aren't so apparent on paper. 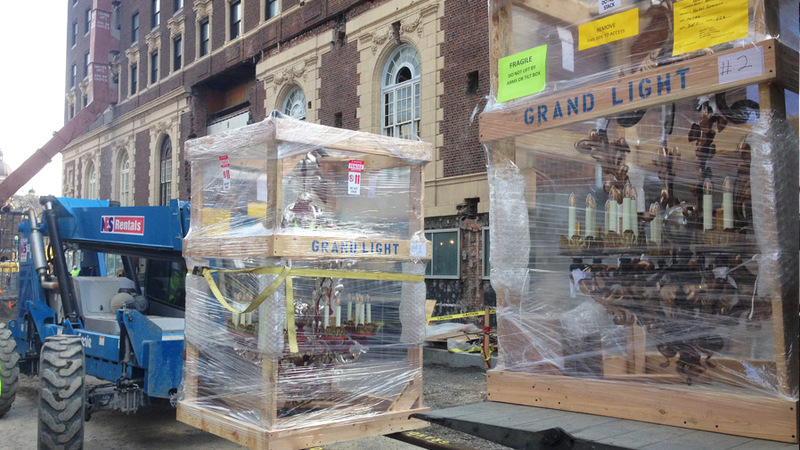 Grand Light’s mechanical capabilities are an essential part of the restoration & custom lighting process. Utilizing only the best materials, Grand Light strives to ensure only the highest quality of standards go into crafting each lighting fixture; from minor components to the complete fabrication of full sized lanterns or other custom lighting fixtures. Using the explicit instructions provided by custom drawings, our factory staff then transform concepts into finished products incorporating the highest regard for accuracy. Grand Light’s technicians inspect and document any mechanical flaws or damage on every lighting fixture prior to any mechanical repair, replacement, or modification. Project documentation, submittals, and reports are made available to clients for approval including work scope, schedule, record of materials, special provisions, and evaluation recommendations based on a lighting fixture’s mechanical integrity. Grand Light metalsmiths have decades of experience fabricating a wide range of raw materials including aluminum, iron, steel, stainless steel, copper, brass, etc. Grand Light strives to ensure only the highest quality of standards go into crafting each lighting fixture. Our metalsmiths fabricate these materials by hand forging or producing components utilizing the lost wax and sand casting processes. Our custom cast metal fixtures offer complex design, quality, and durability. With standards and quality among the highest in the industry, Grand Light’s artisans are capable of offering mouth blown glass, flat glass, and a full range of glass fabricating services including glass bending, lapping, cutting, edging, and polishing. Grand Light utilizes custom precision machined and hand-cutting techniques to replicate, restore, or fabricate new glass components for your custom lighting or lighting restoration project. Our artisans can virtually match or replicate any glass shape, size, and pattern. Grand Light incorporates many methods of metal repair and rejoining. These methods include MIG, TIG welding, and low temperature metal joining techniques such as brazing and soldering. 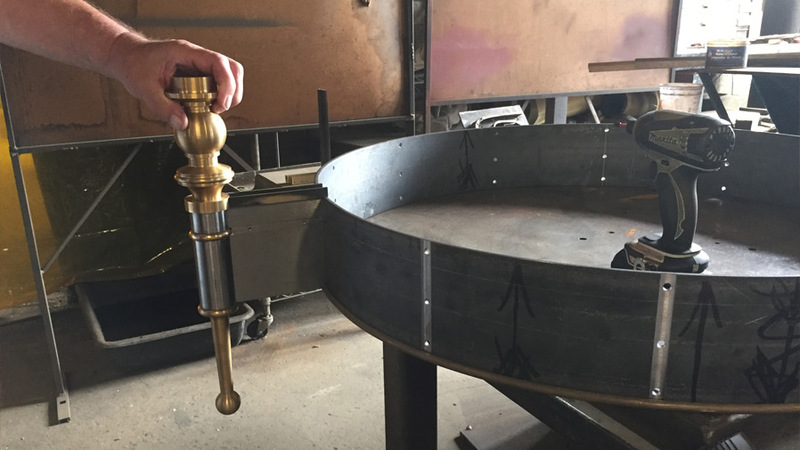 Our craftsmen have years of experience utilizing various metal bonding techniques, resulting in the highest quality custom lighting fabrications and historic lighting repairs and modifications. As a part of the restoration process, our artisans explore the intricate details of preserving the historical integrity of lighting fixtures including color matching and sheen of the original finish. Custom lighting finishes are available in custom painted colors, sheen, and textures as well as custom patina colors on bronze, copper, and brass components. Each surface is cleaned and inspected to determine the optimal surface profile to achieve the desired finish. 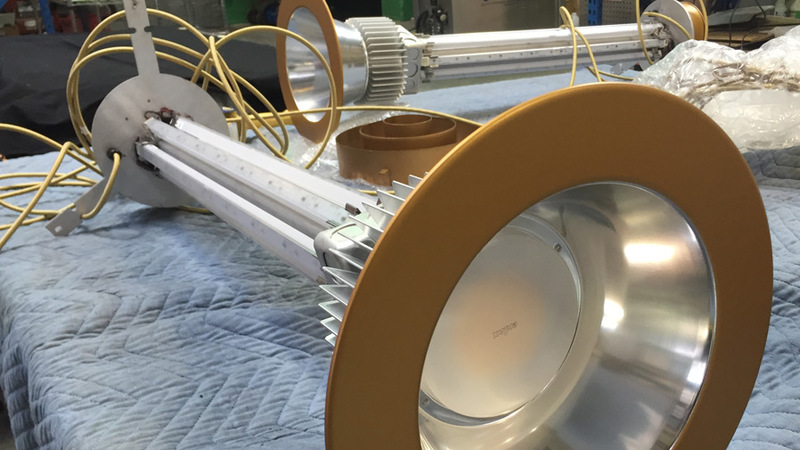 To alter the surface of an existing luminaire, our processes involve a wide range of capabilities including metal polishing as well as media blasting to remove old finishes and foreign material in preparation for a refinish. Our artisans can match any color or finish utilizing a variety of processes involving powder coat, spray, hot or cold patina custom recipes and color blending an existing finish. Grand Light exercises meticulous techniques that are unparalleled in the application of protective coatings including UV resistant protective lacquer with various customized sheens and tints. Finishes requiring a protective wax are hand buffed with multiple coats of museum grade clear and tinted waxes. Each surface is meticulously cleaned by our artisans prior to all finish applications. Grand Light utilizes a wide range of proprietary cleaning solutions and methods including ultrasonic dipping, stripping, soda blasting, and hand cleaning to remove the accumulation of foreign material such as oil, dust, grime, and staining. Grand Light’s industrial ultrasonic console system provides the most advanced and portable cleaning tank available. These powerful units incorporate stainless steel tanks combined with superior Vibra-bar® technology transducers and patented high performance generators providing versatile performance from the simultaneous presence of many ultrasonic frequencies within the cleaning chamber. Each surface is inspected to determine the optimal surface profile to achieve the desired finish. To alter the surface of an existing luminaire, our specialists utilize different types of blasting media, including plastic bead blasting, walnut blasting, glass blasting, garnet and soda blasting. These processes can be used to smooth a rough surface, roughen a smooth surface, shape a surface, or remove old finishes and surface contaminants in preparation for refinish application. Grand Light’s H2O soda blasting equipment’s sensitivity will actually remove the ink from a business card without damage to the underlying paper. Our artisans can match any color or finish utilizing a variety of processes including artist brush, powder coat, spray, and color blending an existing finish. From replicating an existing finish to hand painting intricate patterns, our artisans have decades of experience providing high quality paint applications to historic and custom lighting fixtures. Our restoration artisans have decades of experience polishing and buffing a wide range of metal surfaces including aluminum, brass, copper, silver, and gold. Grand Light utilizes various rouges that graduate from coarse to fine. Our artisans produce surfaces with specular reflection or a satin finish while smoothing surfaces of scratches and imperfections. Our artisans utilize a variety of hot or cold patina custom recipes to create or replicate any color or finish desired. Grand Light artisans creatively burnish patina on surface edges and details to greatly enhance the finish aesthetics. The application of hot or cold patinas are performed in the company’s 20x15ft spray booth with an AbsolutAire Direct-Fired Make Up Air heating and ventilation equipment. All hot patina components are preheated in our two CCI Thermal Tech programmable infrared ovens. Grand Light exercises meticulous techniques that are unparalleled in the application of protective coatings including UV resistant protective lacquer with various customized sheen and tints. A minimum of two coats of solvent based clear lacquer containing tarnish inhibitors are applied to fixtures. Finishes requiring a protective wax are hand buffed with multiple coats of museum grade clear and tinted waxes. 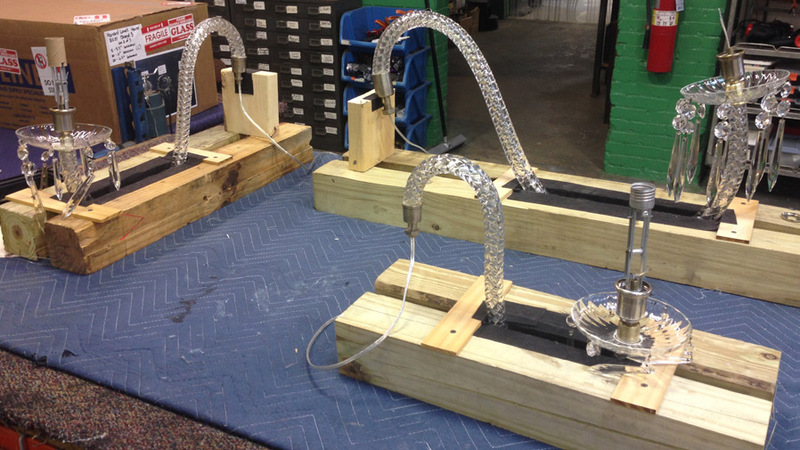 Grand Light’s electrical capabilities are often an essential part of the restoration & custom lighting process. Utilizing only UL listed products, Grand Light strives to ensure only the highest quality of standards go into finalizing each lighting fixture; from the rewiring of luminaires, to the installation of modern lamp technology, and the custom conversion of gas powered fixtures to electric. Using the explicit instructions provided by custom specifications, our technicians transform concepts into finished products incorporating the highest regard for accuracy. 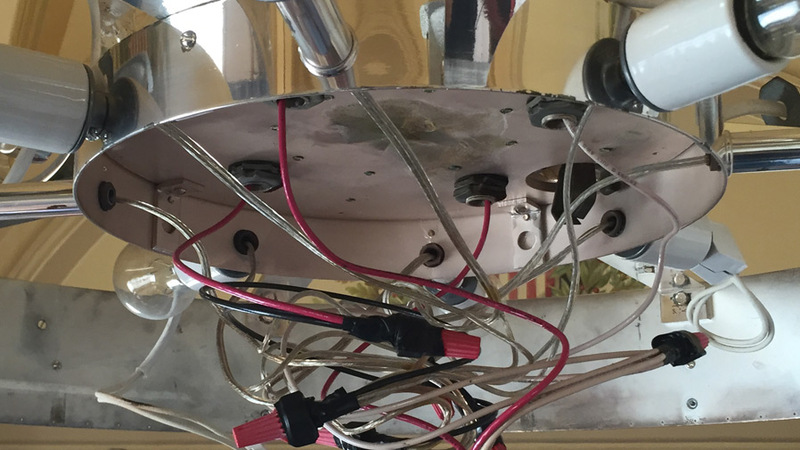 Grand Light’s technicians inspect and document any electrical deficiencies on every lighting fixture prior to any electrical component replacement and rewiring. Project documentation, submittals, and reports are made available to clients for approval including work scope, schedule, record of materials, special provisions, and evaluation recommendations based on a lighting fixture’s electrical integrity. Grand Light offers comprehensive retrofit kits for upgrading existing historic luminaire to take full advantage of modern LED, CFL, HID, and induction lamping technology. Luminaire retrofitting consists of updating the lamps, wiring, and components to provide ease of maintenance, improve lumen performance, maximize lifetime rating, and significantly reduce maintenance and operating costs by reducing energy consumption. Grand Light wiring technicians incorporate premium sockets, tinned wiring leads, copper wiring, secured grounds, multiple strain relief, and enclose in color matching fiberglass sheath. Grand Light standard practice is to perform multiple UL tests on all electrical components and systems to ensure compliance with UL Standards for luminaires. Grand Light’s lighting restoration team specialize in the cleaning, repair, pinning, stringing, and replacement of crystal components of varying sizes, shapes, and cuts. Our artisans have decades of experience restoring crystal components on chandeliers, sconces, ceiling fixtures, and pendants from a variety of clients ranging from private homes, hotels, churches, museums, government, universities, and more. Grand Light artisans specialize in the cleaning of crystal components by offering both hand cleaning and ultrasonic cleaning technology. Our artisans utilize a proprietary cleaning solution before each component is rinsed and hand polished. Grand Light’s industrial ultrasonic console system provides the most advanced and portable crystal cleaning tank available. These powerful units incorporate stainless steel tanks combined with superior Vibra-bar® technology transducers and patented high performance generators providing versatile performance from the simultaneous presence of many ultrasonic frequencies within the cleaning chamber. Artisans specialize in the repair of lighting fixture crystal components including pendalogues, baguettes, spear heads, prisms, tear drops, pears, kites, u-drops, bobeches, arms, columns, and chains. Our artisans can repair broken, cracked, or chipped crystal. Grand Light artisans have extensive experience pinning and stringing crystal components on historic and custom lighting fixtures. Utilizing time proven techniques, our artisans install pinning wire, clips, and connecting rings on crystal components in a wide variety of sizes, shapes, and designs. With decades of experience, our artisans dress a variety of crystal components of different shapes, sizes, and quality on historic and custom lighting fixtures. Each crystal component is hand installed with the highest quality wire to guarantee a secure and durable connection during transportation, installation, and use. Grand Light can replace a wide variety of historic crystal components including pendalogues, baguettes, spear heads, prisms, tear drops, pears, kites, u-drops, bobeches, arms, columns, and chains. 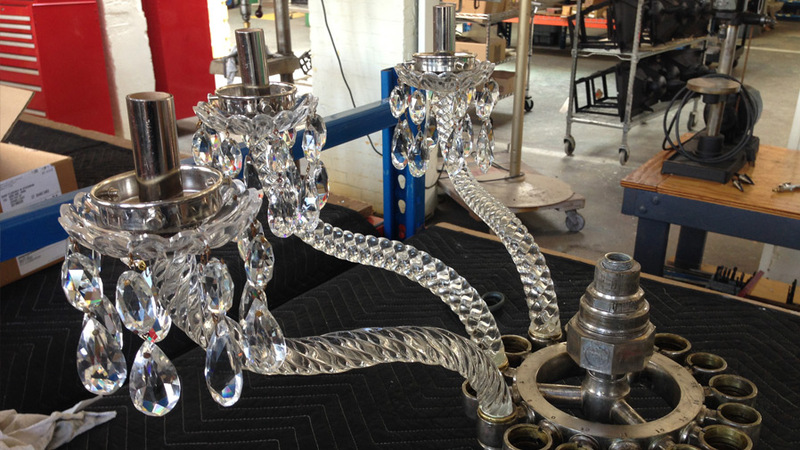 Our specialist will identify and research any missing crystal component on a historic lighting fixture and offer up a similar or exact grade, size, and shape to maintain a fixtures historical integrity. 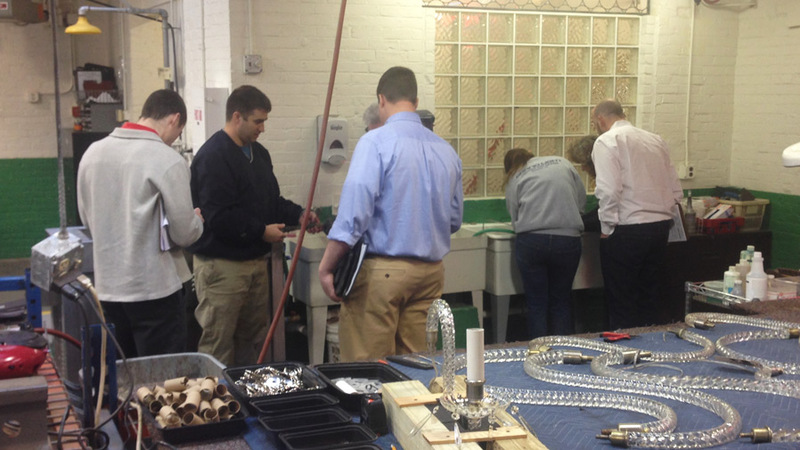 Grand Light’s on-site capabilities are often an essential part of the restoration & custom lighting process. 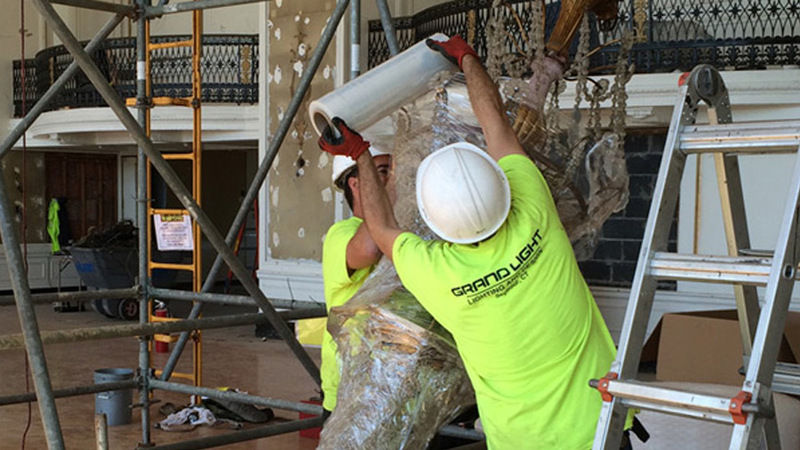 Grand Light specialists strive to ensure historic lighting fixtures are removed, cleaned, repaired, packed, transported, and installed in the safest and most conscientious methods possible. Our approach puts our customer first, with flexible on-site service scheduling offered at the clients convenience and without causing any disruption to daily activities. Work areas are left in the same manner it was found prior to leaving a site. Grand Light’s On-Site Cleaning Specialists utilize leading technology, decades of experience, and an unwavering commitment in providing superior historic lighting restoration results to our clients. Our specialists have a thorough understanding and extensive experience in cleaning a variety of surfaces including metal, wood, marble, plaster, and crystal using proprietary cleaning solutions and advanced ultrasonic technology. 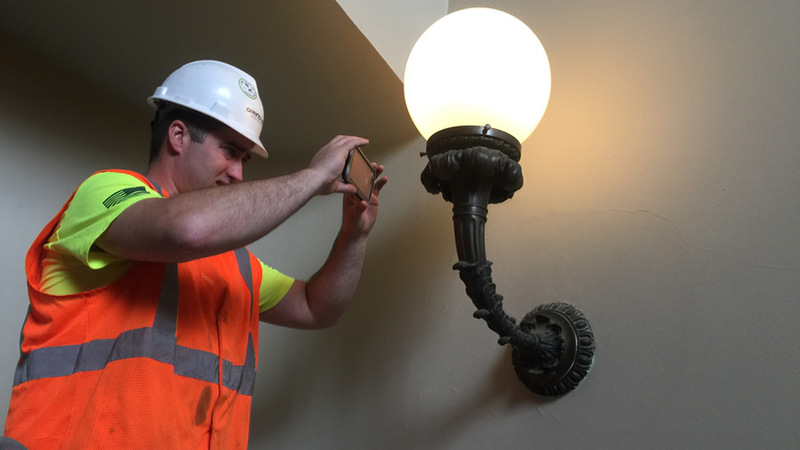 Grand Light’s On-Site Specialist strive to ensure historic lighting fixtures are removed in the safest and most conscientious methods possible. In cooperation with electricians, and using a combination of rigging, ladders, scaffolding, and our portable 30ft lift, our specialist are able to safely disconnect, lower, and disassemble lighting fixtures of various sizes and at varying heights. Once removed each fixture is safely packed and transported to Grand Light’s restoration, modification, and manufacturing factory. Grand Light specialists pack historical lighting fixtures with the highest quality material and care to ensure safe transportation to our manufacturing facility. Every fixture and sensitive component are packed individually using packing methods suitable for its size, weight, shape, condition, and structure. Grand Light specialists crate historical lighting fixtures and custom lighting fixtures using custom constructed crates with the highest quality material and care to ensure safe transportation to and from our manufacturing facility. Every custom crate is built to safely suspend, secure, and contain a lighting fixtures based on its size, weight, shape, condition, and structure. Grand Light specializes in a wide range of nationwide transportation services that include short and long hauls of historic or custom lighting fixtures to and from a project job site. 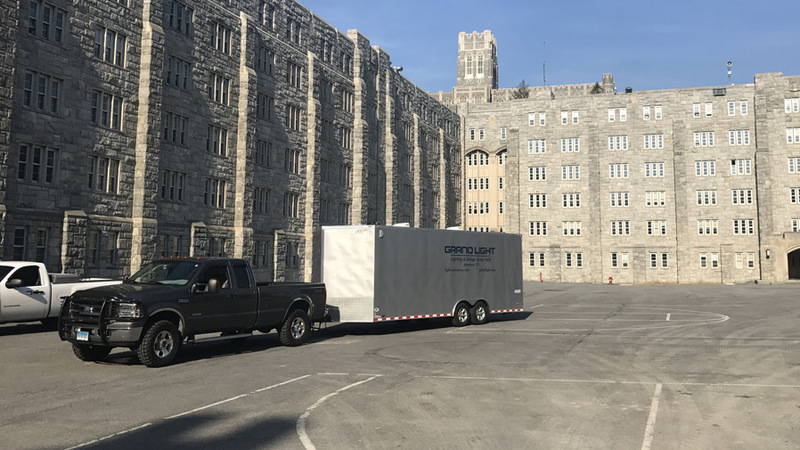 Custom Grand Light trailers are used to safely transport lighting fixtures in combination with safe packing methods and appropriate crating. Our experienced and professional logistics staff offers unmatched efficiency and accuracy through our diversified, full service transportation, warehousing, and distribution. Grand Light’s on-site technicians and specialists, in cooperation with electricians, offer professional installation of restored historic lighting fixtures and custom lighting fixtures. Using a combination of rigging, ladders, scaffolding, and our portable 30ft lift, our lighting professionals offer a wide range of on-site services, including delivery, assembly, inspection, and UL testing. 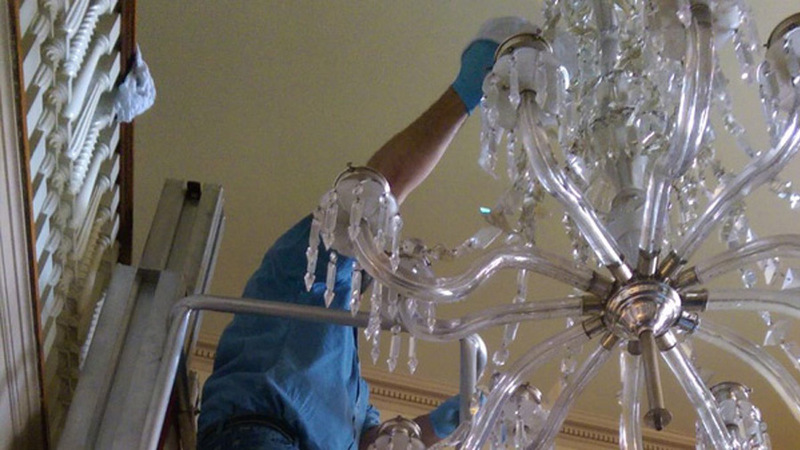 By overseeing and coordinating on-site installation, our professionals can guarantee historic or custom lighting fixtures are installed in the safest and most conscientious methods possible. 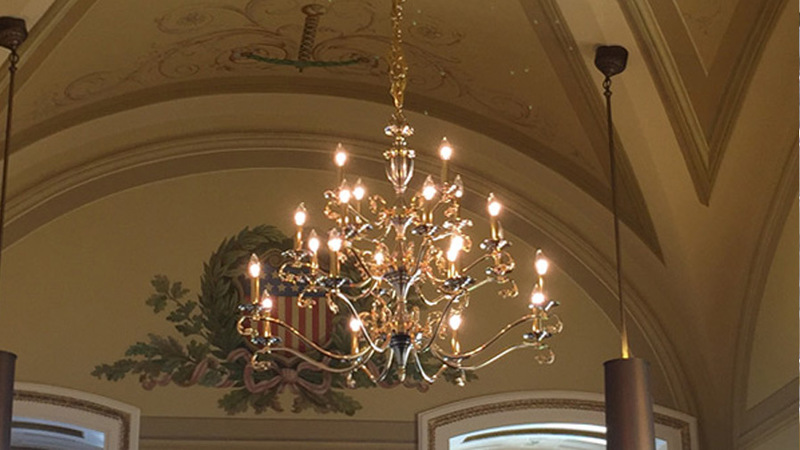 Grand Light provides unique lighting fixtures to replace those that are undergoing restoration. Our catalog offers a wide variety ranging from traditional to modern lighting fixtures to compliment any room, style, or design. At the completion of the restoration, Grand Light specialist remove the temporary lighting and reinstall the restored historic lighting fixtures. We’d love to hear about your project. Let us know how we can help.